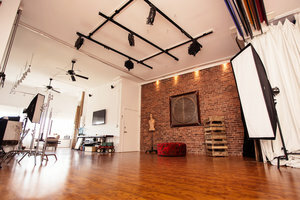 Our studio is a uniquely hand-crafted photo/video studio located in the up-and-coming arts district, Greenwood, Brooklyn (1 block from Industry City). It has been designed as a creative space for all levels of production. 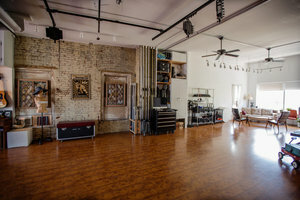 The studio is easily accessible via express trains, Battery Tunnel, and BQE. Close to Industry City, Park Slope, Red Hook, Bush Terminal, and Sunset Park. The studio offers a main interior 1000 sq. ft. shooting space with a clean brick wall, a distressed brick wall, white wall, and 16’ x 7’ unobstructed, south facing window offering beautiful natural light all afternoon. Additionally there is a 750 sq. 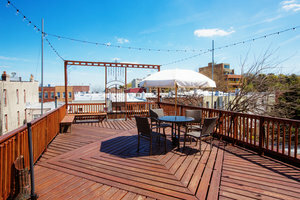 ft. custom designed roof deck on one floor, and a 1000 sq. ft. raw roof on the top floor.